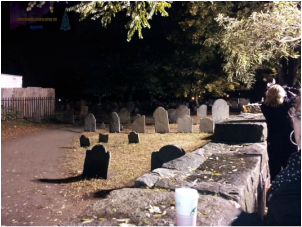 ExPERT Investigation of Gallow's Hill in Salem, Ma. Nothing can be of more Paranormal lore than the legends surrounding the Salem Witch Trials of 1692, where, for a period of several months (June through September) numerous residents of the town, were tried convicted and executed in various manners for witchcraft. Trials did however last until May of 1693. From a 19th century text, a photo of the house in which the first accused were living. Evidence of witchcraft included confessions of the accused, the testimony of a person who confessed to being a witch identifying others as witches, the discovery of "poppits" (books of palmistry and horoscopes) ointments in the home of the accused and of all things, "witch's teats" on the body of the accused. A "witch's teat" was said to be a mole or blemish somewhere on the body that was insensitive to touch and was considered evidence of witchcraft. In 1711. some twenty-one years later, all the courts decisions were reversed as well as their excommunications. Ironically that didn't bring back the accused from death. 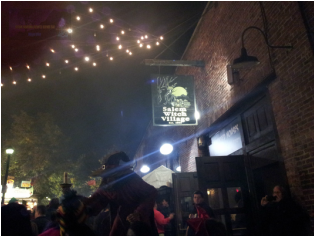 Salem on Halloween is one of the largest outdoor festivals in the country. 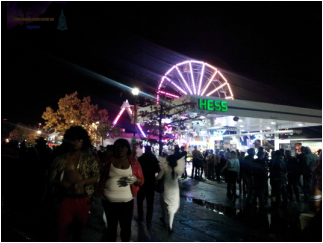 The crowd on Halloween 2013 was estimated over 20,000 and was Massachusetts largest outdoor event since the Boston Marathon Bombing. The Old Burying Ground. Aside from the Memorial to the executed just outside of the graveyard, no executed "witch" was buried here. On November 1st, 2013 ExPERT Founder Stacey Horton and Co-Founder Steve Kulls went to "Gallows Hill" located in Salem, to conduct an EVP / Flashlight test. The location was picked for obvious reasons and we felt that spirits are more tied to their place of death under these circumstances rather than their place of burial or homes. It's also an area that paranormal investigators don't usually travel to. They began the session which lasted for approximately 45 minutes. They set up two recorders, two flashlights and a K2 meter, which blinked only very briefly once during the session and we considered it unremarkable. There was much background, and wind, however they did capture some amazing evidence for their short period of time investigating the area. One of the more interesting things they had captured was while we were video recording our entire session. The session was videoed with a normal HD recorder (Kodak Sport Cam), with no light amplification, no use if the infrared or ultraviolet spectrums. Despite this they managed to capture what appears to be several manifestations next to their flashlights and recorders. Within seconds of the manifestation disappearing, Steve's digital recorder, which was next to the manifestation goes off for no apparent reason. The manifestation was not seen by either Steve nor Stacey and was only discovered upon evidence review. 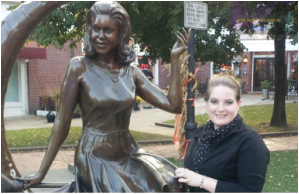 Stacey asks, "Did you die of natural causes?' Despite the airplane flying overhead, you clearly hear a young female state, "DID NOT!" In response to Stacey thanking for turning flashlight on after asking "Were you a witch or convicted of being a witch?" We are not sure if this is a male or female voice, or if it was telling Stacey and Steve to die, or could it be an executioner telling the "witch" to die? As Stacey and Steve continue their session, Steve hear's something walking near him. This audio was take from Steve's recorder. After listening to the recording we ruled out wind as the cuase of the sound. The footstep was absent from Stacey's recorder which was sitting within two feet of Steve's recorder. We know the sound was there because both Stacey and Steve heard it with their own ears. Gallows Hill, Salem, Massachusetts November 1st, 2013. At first Stacey thought Steve was kidding around during the evidence review. Keep your eyes focused near Steve's recorder, the light on the lower left. For several seconds you will see, streaks of light inconsistent with any camera movement and it intensifies just prior to the second flashlight going out. Shortly thereafter, Steve's digital recorder will turn off for no apparent reason. 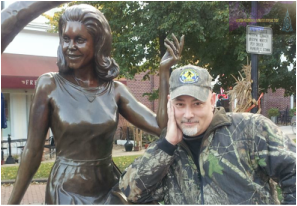 Stacey and Steve at the Tribute statue to Samantha the witch on the popular television show "Bewitched." Bizarre enough, there is so much positive energy let alone what they saw on Halloween, (a strange mixture of both yet positive outnumbered negative) it negates and cancels out a great deal of the negative energy. What is for sure is that the investigation of November 1st, 2013 at a site of utter and tragic injustices which took place many centuries ago, still appears to have some of the fallen trying to tell their story and somehow look for justice.